If any of you are good with your hands (or your mum or dad is! 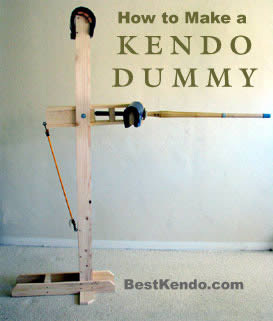 ), you might like to try making this kendo dummy. 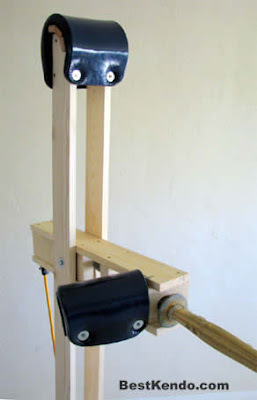 I haven't made one but it looks good and the detailed plans are free to download. wow, thanks ben. i was actually going to make a kendo dummy with some spare tyres and some timber, but i think i might stick to the instructions. sure thing. i might be changing my idea as i just found my original dummy(my sis :P, not really) out the back. its a perfect size and the plastic should be easy to drill into. ill try to take lots of pictures! Soon I shall have an army of kendo dummys, with which i shall rule the world. But the fact that it uses an octopus strap doesn't seem very safe. Also the bolts that sort of look like eyes are a nice touch.